New Release. Price £525.00 + FREE Mainland UK Delivery. Bright pink hue with delicate salmon-pink tints. Soft, even sparkle that fills the glass and gives the wine an almost creamy appearance. The juicy and fleshy attack is underpinned by a direct, intense freshness. It displays simultaneously solid and fluid powdery notes harking back to the tannins in the pips which were perfectly ripe and lignified. There is an explosion of intense, rich, fresh flavours, complemented by notes of hazelnut and a powdery, almost oily, mouthfeel, characteristic of the finest Pinot noirs. There is an impression of chalkiness on the finish with zesty notes reminiscent of candied citrus and yuzu. This is fantastic with lobster and beluga caviar, or a gourmet salad: lobster and foie gras. It also works with seared salmon or poached sea trout. The 2008 vintage was characterised by an unusually dry and cool summer and undoubtedly falls into the ‘continental’ vintage category: dense and powerful owing to its exceptional concentration. Nevertheless, the unusually cool temperatures over the summer made their mark on the vintage, giving it a remarkable intense and saline freshness. A blend of 56% Pinot Noir and 44% Chardonnay, comprising 16% of wine vinified in wood (oak tuns), which undergoes weekly bâtonnage (stirring by hand) - 17% malolactic fermentation. Louis Roederer’s Rosé champagnes are always produced using the saignée (bleeding) process after cold maceration for five to eight days in the liquid phase. The Cristal Rosé cuvée is aged, on average, for six years in Roederer’s cellars and left for eight months after dégorgement (disgorging) to attain the perfect balance. Cristal Rose 2008 was bottle-aged for 8 years before being left to rest for at least 8 months after disgorging in order to attain perfect maturity. The dosage is 8 g/l. Established in 1776, Champagne Louis Roederer is one of the few remaining completely independent family owned, great Champagne houses. By 1876 the House had achieved such a reputation for quality that the second Louis Roederer was asked by Tsar Alexander II to create Cristal for the exclusive use of the Russian Tsars and in so doing created the first ever Cuvée de Prestige. In 1974, nearly 200 years after the creation of the Maison Louis Roederer and 100 years after the creation of Cristal, Jean-Claude Rouzaud decided to create Cristal Rosé. To do this end, he selected old vine pinot noir grapes, according to specific characteristics, located on the finest of the Ay vineyards. Exceptionally, these vines lie on a limestone block with clay and limestone soil and in the best years, the vines achieve extraordinarily mature fruit with a crystalline purity of acidity corresponding perfectly to the Cristal style. Today these vines are organically grown. 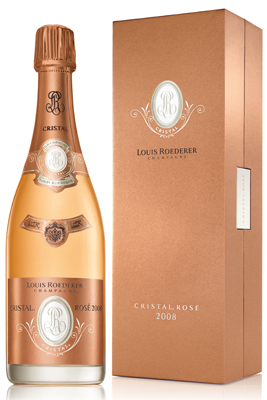 Cristal Rosé is the rarest champagne produced by Champagne Louis Roederer. When the ideal vintage occurs and the wine is produced, it is done with regimented standards of winemaking that require a rigorous selection of crus, vintages, grapes and wine. The traditional skin maceration is used in order to gently extract the natural pigments for the unique colour and create the particular style of this rosé. The cuvée Cristal Rosé is produced exclusively from the best grapes of Louis Roederer's own "Premier Cru" vineyards, primarily those of Ay, Verzenay, Verzy and Cumières for the Pinot Noir, and Le Mesnil sur Oger and Avize for the Chardonnay. Exceptionally, these vines lie on a limestone block with clay and limestone soil and, in the best years, the vines achieve extraordinarily mature fruit with a crystalline purity of acidity corresponding perfectly to the Cristal style. Today these vines are organically grown. The annual production of its wines (Brut Premier, Carte Blanche, Brut Vintage, Rosé Vintage, Blanc de Blancs, Cristal, Cristal Rosé) represents just over three million bottles, distributed to 100 countries worldwide. In 1974, almost 200 years after the establishment of the Champagne house of Louis Roederer and 100 years after the creation of Cristal, Jean-Claude Rouzaud decided to create the Cristal Rosé cuvée. To achieve this, he selected old-vine Pinot Noir grapes using massal selection, which involves propagation from the vineyard's most successful plants.